From Canada's first ever giant panda cubs in Toronto to the smallest giraffe born at San Diego Zoo, and a orangutan mom who's fostered three babies at Zoo Atlanta, a number of CityPASS partner zoos have welcomed new arrivals. Read on to learn more about just a few of the cute new faces and the conservation efforts their home zoos work on every day. Mom Josie and son GoJo at Tampa's Lowry Park Zoo. Photo credit:Tampa's Lowry Park Zoo. 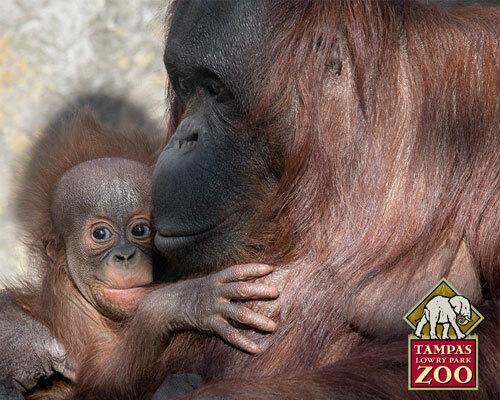 At Tampa's Lowry Park Zoo, mother and daughter orangutans gave birth within two months of each other. Josie, a 30-year-old Bornean orangutan, gave birth to a male offspring on December 20 named "GoJo," a blend of his parents' names. On February 17, a 10-year-old Bornean orangutan named "Hadiah" (Josie's daughter) gave birth to her first offspring. The newest baby, a female named Topi, creates a third generation of the orangutan family living at the zoo, which is home to seven endangered orangutans. Orangutan means 'person of the forest' in the native languages of Indonesia and Malaysia. Orangutans share 97% of the same DNA as humans. Bornean orangutans use tools in daily activities. For example, they use branches to test water depth and find insects. They also use leaves as umbrellas, sponges, or napkins. Orangutans are the only great apes in the world that are from Asia. An orangutan's arms are longer and stronger than its legs. Baby orangutans cry, whimper, and smile at their mothers – just like human babies do. Conservation: Orangutans are teetering on the edge of extinction, due to the destruction of their rainforest home. The islands of Borneo and Sumatra are the only two places in the world where wild orangutans can be found. The zoo works with Orangutan Outreach, an organization that raises funds to rescue, rehabilitate, and release orangutans back into the wild, to support Orangutan conservation. The Zoo also takes part in Orangutan Caring Week, a week in November dedicated to raising awareness of the challenges faced by wild orangutans. Giant Panda Cubs Jia Panpan and Jia Yueyue. Photo credit: Toronto Zoo. 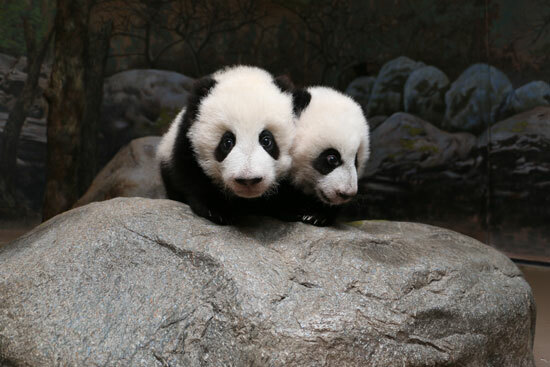 Jia Panpan and his sister, Jia Yueyue, were born at the Toronto Zoo in October and made their public debut on March 12. Their names mean Canadian Hope and Canadian Joy, and the twins are Canada's first giant panda cubs. Female giant pandas are only receptive to breeding once a year for a period of 24 to 72 hours. A giant panda is born pink, hairless and blind, and is 1/900th the size of its mother (about the size of a stick of butter). A giant panda's digestive system is more similar to that of a carnivore than a herbivore, yet they have adapted to a vegetarian diet of bamboo, which makes up 99% of what they eat. Conservation: The giant panda is listed as endangered in the World Conservation Union's Red List of Threatened Species. According to the National Zoo, about 1,600 giant pandas are left in the wild. At one time, giant pandas were much more widespread in China. Now they live in a few mountain ranges in Sichuan, Shaanxi and Gansu provinces. The Toronto Zoo supports a bamboo and habitat restoration project in China through the Endangered Species Reserve Fund in collaboration with the Memphis Zoo. The Toronto Zoo is also the only zoo in Canada to employ a Reproductive Physiologist, who investigates ways to improve the reproduction of endangered species and contributes her expertise to breeding programs. 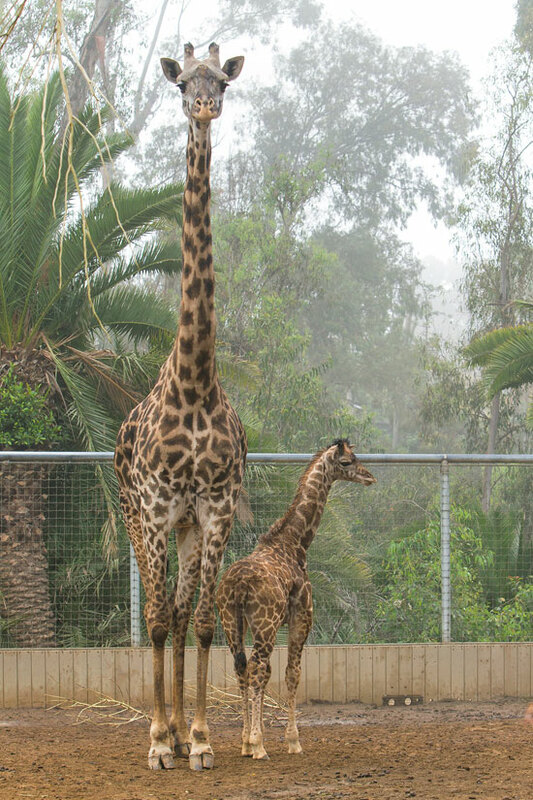 Born on December 12, 2015, at 5 feet 3 inches tall and 117 pounds, Obi, whose name means "heart" in Swahili, is the smallest giraffe born at the San Diego Zoo in 15 years. By two months of age, though, Obi had caught up, tipping the scales at over 270 pounds and standing almost 7 feet tall. His caretakers say he's a sweet and curious giraffe with a great personality. A giraffe's feet are the size of a dinner plate—12 inches across (30.5 centimeters). Giraffes have the same number of vertebrae in their necks as we do—seven. A giraffe's tongue is 18 to 20 inches (46 to 50 centimeters) long and blue-black. The color may keep the tongue from getting sunburned. Giraffe calves grow 1 inch (2.54 centimeters) each day during their first week. Conservation: Giraffes, sometimes called the watchtowers of the savanna, are slowly disappearing. In many African countries, giraffe populations are decreasing because of poaching, habitat loss and overgrazing of resources by livestock. Two giraffe subspecies—the West African or Nigerian giraffe and the Rothschild's giraffe—are now endangered. San Diego Zoo Global has partnered with the Giraffe Conservation Foundation, as well as other conservation organizations, to help conserve giraffes in East Africa. This year, a team of scientists from the San Diego Zoo Institute for Conservation Research has been developing a conservation project with Kenyan pastoralists to find ways to collaborate and protect giraffes in the savanna, including creating a fenced sanctuary for the giraffes. 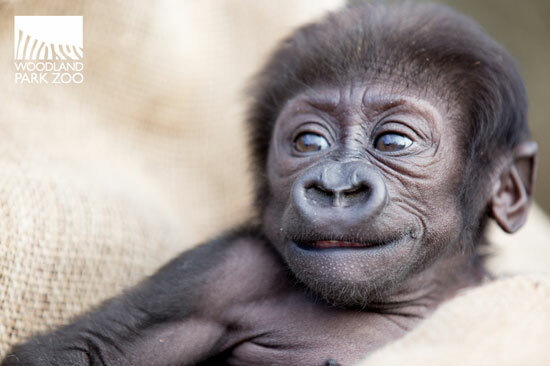 Yola, a female baby gorilla born at Woodland Park Zoo. Photo Credit: Jeremy Dwyer-Lindgren/Woodland Park Zoo. A female baby western lowland gorilla, "Yola (rhymes with Lola)" was born November 20 to 19-year-old Nadiri at Seattle's Woodland Park Zoo. Yola, which means "firefly" in Hausa, is currently being raised by zookeepers after the first-time mom walked away after giving birth and did not show appropriate maternal behaviors. However, the baby is being raised in close proximity to her gorilla family and is making progress in developing a relationship with Nadiri. During the visits, Nadiri will frequently spend a good deal of time lying or sitting by the baby, touching her and gently investigating her hands, face and ears. The baby is also reaching out to Nadiri, holding onto Nadiri's arms, fingers, and touching her face. As of mid-March, Yola remains off public view and under 24/7 care in a den of the gorillas' sleeping quarters. January is a baby Gerenuk, a species of long-necked gazelle. Photo Credit: Houston Zoo. 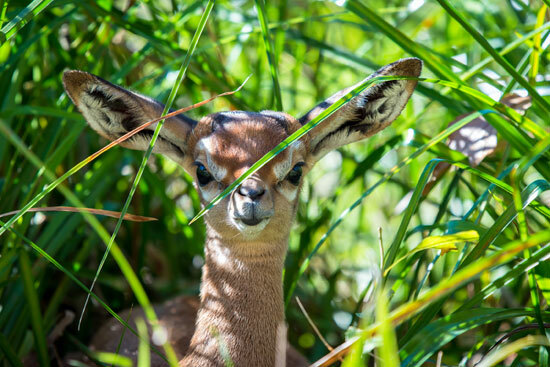 A female gerenuk calf was the first baby of 2016 born at the Houston Zoo. Named January, in honor of her birth month, she spends time with mom Josie and the rest of the gerenuk family. Gerenuk are a species of long-necked gazelle and native to the Horn of Africa. The word "gerenuk" means "giraffe-necked" in the Somali language. Gerenuks stand on their back legs to reach their food. A gerenuk can go its entire life without drinking water. Female gerenuks use a lighter, more delicate tone when communicating with their young; they bleat very softly. Mshindi is the youngest member of the Dallaz Zoo chimpanzee troop. Photo credit: Cathy Burkey / Dallas Zoo. 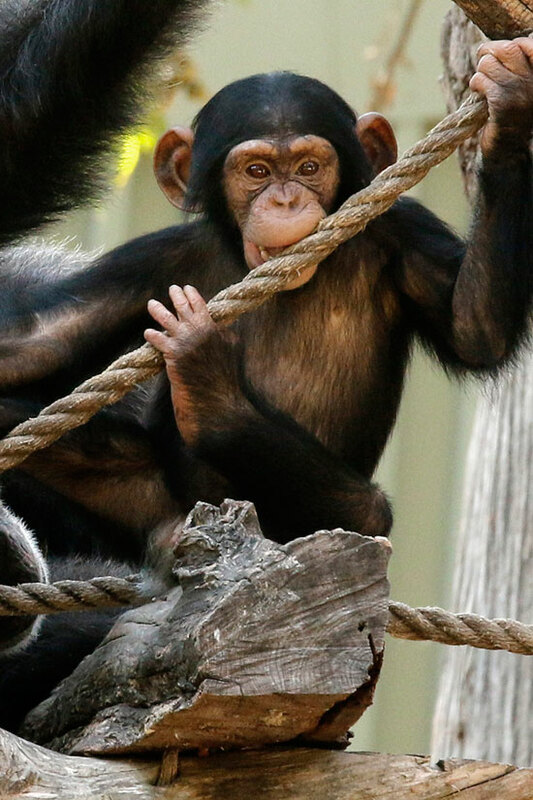 The youngest member of the Dallas Zoo chimpanzee troop is two year old boy Mshindi, who lives with his mom, Ramona, alpha male father KC and six year old Brother Kona. At 2, Mshindi is becoming increasingly independent, but will stick close to mom for several more years. He's also fond of getting rides from big brother, Kona. Humans share 98% of DNA with chimps, more than any other species. Chimpanzee communities may range in size from 15 to 120 chimps of both sexes and all ages. Infants are dependent upon their mother for at least 5 years, and can usually live independently by age 6, but still spend considerable time with their mothers even into adulthood. Chimpanzees' body temperature is the same as humans, at 98.6 degrees. Conservation: The Dallas Zoo is a participating sponsor of the AZA Ape Taxon Advisory Group (TAG) Conservation Initiative, which has developed an eight-project campaign supporting the future of one of the planet's most imperiled group of animals – apes. For apes – bonobos, chimpanzees, gorillas, orangutans, gibbons, and siamangs – the outlook in the wild is bleak. It is estimated that some ape species will be extinct within 20 years. Click here to learn more about helping chimpanzees. 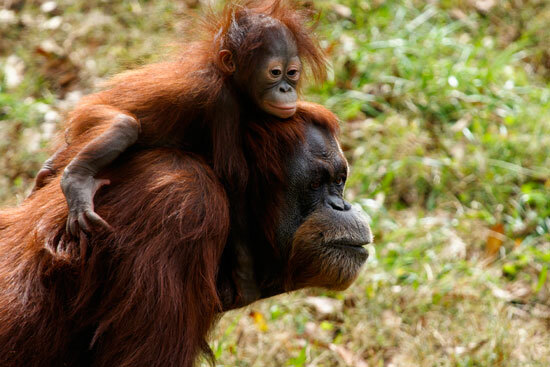 Keju is being raised by surrogate super mom Madu at Zoo Atlanta. Photo Credit: Zoo Atlanta. Born in April 2015, Bornean orangutan Keju moved from the Henry Vilas Zoo in Madison, Wis., to Zoo Atlanta to meet the remarkable ape that Zoo Atlanta experts hope will become her new mother. On October 29, 2015, at 6 months of age, Keju met Madu, a 32-year-old female "super mom" Sumatran orangutan who has successfully fostered three youngsters over the past 13 years. Madu took to Keju instantly and has been happily caring for Keju ever since. Keju's name means "cheese," a special nod to her hometown of Madison, Wisconsin. The orangutan is the largest tree-dwelling mammal in the world. The name "orangutan hutan" means "person of the forest" in the Malay language. The only long-term bonds orangutans have are those between a mother and her offspring. Wild orangutans will often encounter one another and just pass by peacefully unless the encounter is between two adult males. Conservation: The primary threat to orangutans is habitat loss due to human activities, such as logging, deliberate forest fires and timber clearing for farming. Other specific threats include clear-cutting of forests for palm oil plantations, encroachment of human settlements and hunting for meat and the illegal pet trade. In 2008, Zoo Atlanta and the Ape Conservation Effort donated $6,000 to the Nyaru Menteng Orangutan Rehabilitation Center founded by Lone Droschler-Nielsen and Dr. Willie Smits. Funds were applied to urgently needed medical supplies for sick and injured orangutans rescued from the pet trade and palm oil plantations. Nyaru Menteng is currently the largest orangutan rehabilitation center in the world and is home to over 650 orangutans. Click here to learn more about Zoo Atlanta's conservation efforts. CityPASS is proud to partner with all of these zoos as well as many other amazing attractions in 12 great destinations: Atlanta, Boston, Chicago, Dallas, Houston, New York City, Philadelphia, San Francisco, Seattle, Southern California, Tampa Bay and Toronto. Visit citypass.com for more information.